Here is our favourite way to do Chicken Meatballs. They’re spiced up with a sweet, savoury, and spicy firecracker sauce. They’re tender, seasoned with the rich flavour of Knorr Chicken Seasoning, and require minimum work! View the full recipe below. In a large bowl, combine the chicken, Knorr Chicken Seasoning Powder, egg whites, mushrooms, Knorr Lime Seasoning Powder, ginger, garlic, soy sauce, coriander, five-spice powder, pepper, and mix well. Roll 1 heaping tablespoon of chicken mixture into a ball and continue until all the chicken mixture is used. In a wok over medium heat, heat the peanut oil; fry the meatballs until golden. 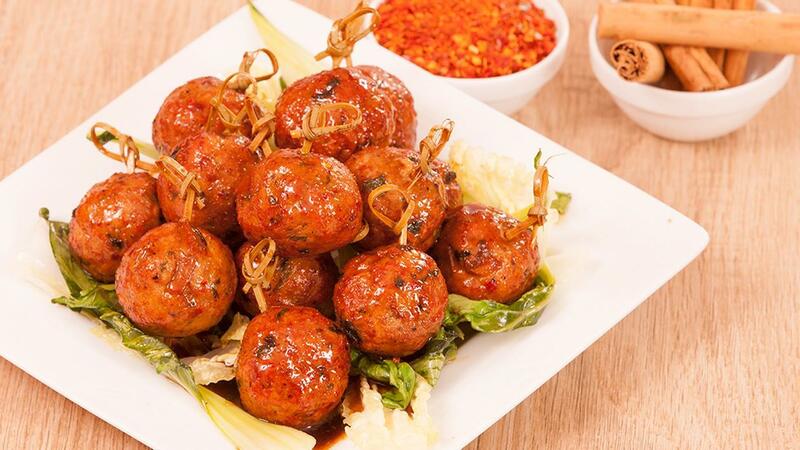 The fried meat balls in cinnamon glazed for few seconds. Served on a stir-fried mix greens.